No matter how much experience you have, boating safety rules should be reviewed before each departure. As Captain of the vessel you are responsible for the safety for those on board. Make sure everyone understands where the safety equipment is located and what to do in the case of an emergency. Always check local weather conditions for boating safety the day before and of departure. TV and radio forecasts can be a good source of information. If you notice darkening clouds, rough changing winds, or sudden drops in temperature, play it safe by getting off the water. Is my boat licence and registration current? Have I made myself familiar with the area I am going? Check the tide to ensure the ramp is suitable for launching. Checked the boat for defects and note any required repairs. Do I have enough fuel for the round trip, plus reserves? Do I have sufficient water and food for the return trip, plus reserves? Is all the appropriate safety equipment onboard and in working order? Have I shown my passengers where the safety equipment is and how to use it? Have I advised a reliable person of my boating plan? This is best written down and handed to the person prior to your departure. Include where you are going and when you plan to be back as well as the number of passengers on board and type of radio and emergency beacon you are carrying. These details are very helpful in an emergency. One of the most important parts of boating safety is to use your common sense. This means operating at a safe speed at all times, especially in busy areas. Be alert at all times. Steer clear of large vessels and watercraft that can be restricted in their ability to stop or turn. Also be respectful of buoys and other navigational aids, all of which have been placed there for one reason only- to ensure your own boating safety. Make sure more than one person on board is familiar with all aspects of your boat’s handling and safe operation. If the primary navigator is injured or incapacitated in any way, it’s important to make sure someone else can follow the proper boating safety rules to get everyone else back to shore. Whether you choose to inform a family member or staff at your local marina always be sure let someone else know your float plan in terms of where you’re going and how long you’re going to be gone. A float plan can include the following information: name, address, and phone number of trip leader: name and number of all passengers; boat type and registration information; trip itinerary; types of communication and signal equipment onboard. Did you know that the majority of drowning victims as the result of boating accidents were found not to be wearing a Lifejacket? In Australia approximately 45 people loose their lives each year in recreational boating accidents and most of them are from drowning. Make sure that your family and friends aren’t part of this statistic by assigning and fitting each member of your onboard team with a Lifejacket-prior to departure. See link below for more information on lifejackets. One third of all boating fatalities involve alcohol. The blood alcohol limit on the water is the same as on the roads – 0.05%. Extra care is needed as the wind; waves and the sun combine to multiply the effects of alcohol. Your chances of disorientation and drowning are dramatically increased. If you’re going to be in and around the water, proper boating safety means knowing how to swim. Visit Swim Australia for an Adult Learn to Swim School in your area. Beginning boaters and experienced experts alike need be familiar with boating safety rules of operation. Boater education requirements vary by state- some require validated completion of at least one boating safety course. Regardless of your individual state’s requirements, it’s always important to be educated, aware and prepared for every circumstance that might arise. It could save your life or the life of someone you love. The ABP makes recreational boating safer by providing vital information about the capacity of boats including the maximum number of people and load allowed, engine rating and weight and for boats less than 6 metres in length information about buoyancy performance. For further information visit the National Marine Safety Committee website or contact your boat’s manufacturer. Buy a good Lifejacket or life vest with a collar that turns a child face up in the water. It must have strong waist and crotch straps, a handle on the collar, and preferably be a bright yellow or orange colour for good visibility. Attach a plastic safety whistle to the Lifejacket and teach the child how to use the whistle – and practice using it. Additionally, ensure that children thoroughly understand safety procedures and can respond appropriately in an emergency. Practice safety drills and situation role-plays so that emergency procedures become second nature to you and your children. NSW Maritime advises it is a must to have a lifejacket available for all people on board and it must be in good condition, ready at hand and of the correct size. Lifejackets are available in a wide range of sizes to suit adults down to young children. For infants where a correctly-sized lifejacket is not available, NSW Maritime recommends parents to keep the child close at all times while afloat and to have their own lifejacket ready for instant use or to put it on at times of heightened risk. Heightened risk includes occasions when conditions get rough or a storm or squall approaches. While it is only compulsory to wear a lifejacket in NSW while crossing coastal bars, riding a jetski or in a paddle craft or windsurfer more than 400m from shore, Maritime recommends children and poor swimmers wear on at all times when in the open areas of a boat which is underway. Children must also be kept within the bounds of the vessel and should never sit with their legs or arms dangling over the sides of a powerboat that is underway. dangerous and must not be encouraged. Not only is a child close to the propeller in such a situation, they are also likely to be exposed to carbon monoxide poisoning via exhaust fumes. A mobile phone is not enough. It can only reach one person, and can become water damaged very easily, run out of battery or the reception can drop out. If something goes wrong with your mobile your lifeline to safety is gone. A ‘Mayday’ call-out on a Marine Radio can be heard by many people – instantly, getting help to you more quickly. It is also purpose built and is a lot reliable than a mobile phone. When night falls it is a completely different world on the water, and so vessels that operate from sunset to sunrise, whether at anchor or under way, must carry and exhibit the correct lights. BE BRIGHT AT NIGHT! More information on night safety at NSW Maritime. 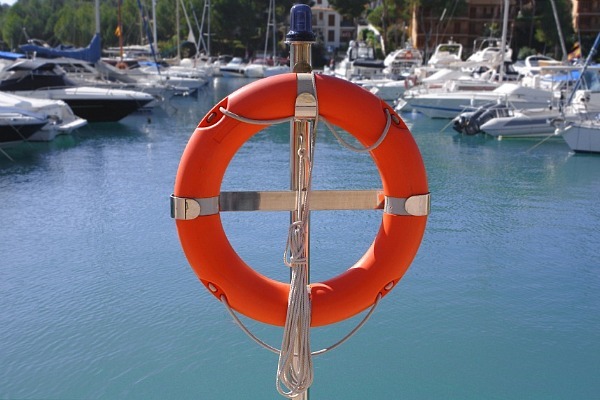 Do you know of a great boating safety website? Why not tell us about it. Email us.